Our Moving ServicesBook Us NOW! We are locally owned and operated and do residential and commercial moving. We have the best rates so Call Us today at 504-471-0076 for a free estimate! When you’re moving from your old house to a new location, there are thousands of things to be taken care of. We’ll be your assistants, helping you move all your belongings safe and fast wherever you wish! In our opinion, every single type of a professional activity comes down to service and quality it’s been performed with. And these 2 depend heavily on the teamwork – hence the quality of the crew you have, their expertise, skills, and the overall team management…We’re proud to have dozens of people having been working for us for many years, appreciating our company’s mission of helping the city of New Orleans and surrounding areas move in a better, more affordable fashion. All of our team members are fully prepared, equipped and ready to make the moving process an easy trip for you and your belongings! As we specialize in the local area moving processes, keeping a low pricing policy is an essential thing for us! Roge’ and his crew have moved me 2 times now. I can’t say enough good things about them. They are very professional and reliable. I would recommend them to anyone. I was very happy and impressed by how professional these guys were. I would definitely recommend this company! You guys were fast and took care of all my belongings . Thanks !! I was conflicted about our move from New Orleans to Florida and was thinking about just doing it myself with a Uhaul. Then I found EZ movers. I am so glad I did! Ro and his team were amazing! They were professional and courteous and packed me up in less than 2 hours. 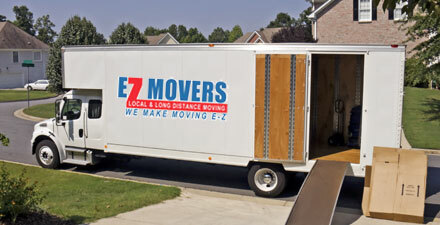 I could not have been more pleased with the experience I had with EZ Movers. They were extremely helpful, friendly and very well priced. I would definitely recommend them to anyone who is dreading moving as much as I was. I will definitely be calling them again the next time I move! Thank you EZ Movers! Even though this move was tough, I was so blessed by the wonderful moving company that moved my furniture. I have had nothing but awful experiences in the past with moving companies, so this was a pleasant surprise!